The Reading Revolution is taking off in Northern Ireland, with the appearance of Reading Rooms across the city of Derry-Londonderry. The Reader Organisation teamed up with Verbal Arts Centre (VAC) in May last year, when they commissioned us to assist in bringing shared reading to the city in the form of the Reading Rooms project. The project has proved to be a real success with people of all ages enjoying shared reading around the city in a variety of settings, from schools to residential care facilities, coffee shops to community centres. 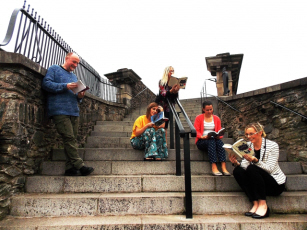 As part of the project, TRO-approved training has been offered for local volunteers to lead their own shared reading groups, establishing and embedding a culture of reading in the city with a legacy that lasts beyond the City of Culture 2013 celebrations. “Magiligan Prison held its first Reading Room on January 14th with six participants. The second meeting on the 21st had almost doubled to ten participants on sheer word of mouth alone. Feedback from the participants has been (typically) heartening already – with one participant asking me if I’d ‘…ever heard of a story by Anton Chekhov called The Bet? It would be very good for lads in prison…’ Needless to say I know what I’m bringing next week. I will also be travelling to Belfast once a week starting mid-February to look at the creation of a new Reading Room there in partnership with the 174 Trust. There is more training in the pipeline (for some new Belfast volunteers and for more care home volunteers) in March – so we’ll be bringing The Reader Organisation’s excellent trainers back over again for that. We’re also excited to welcome Kate back in February for a top up Masterclass with some of the volunteers she trained last year. So keen were they to see her again, the Masterclass was half full before we even sent out the letters advertising it! Kate will also be visiting seven of the groups for Quality purposes. I’m delighted at how glad our regular groups are to have us back. ‘As if Christmas wasn’t bad enough,’ said Jack, one of my care home group members. It’s strange how the short break has allowed us to come back and stop feeling quite so ‘new’ and a little bit more like our reading group has become embedded – something they look forward to once a week. It’s lovely to watch them settle down with a cup of tea and get their reading glasses on and get ready to get stuck in – they know how it works now and they’re ready for it.